The passive house concept is being furthered, as more homeowners are looking into smart designs. Can we think outside of the box when it comes to these ideas? The other evening I am sitting in the garden with my family. We were enjoying the cool breezes. I was actually planning out my garden, since I wish to begin work on a greywater system. I want the system to be able to accommodate my desires for the home, so I do not wish to rush into trying to create it before I have a firm idea on what needs to be accomplished. I had my sketch book by my side when I spotted two thick glass sheets that I have stored behind the shed. I quickly came up with an idea of how to use them, which involved creating a system for passive heating, solar water heating, and lighting some dark areas of the home. 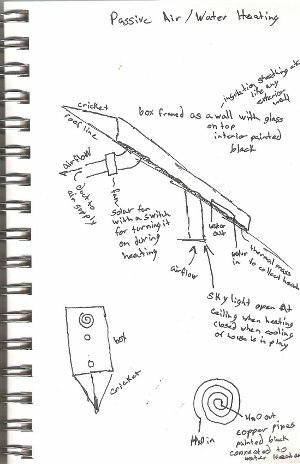 This is a really rough sketch that began with a though of how I could make a solar water heater while creating a skylight. The girls were climbing over me to have their turn with the drawing, but I wanted to capture my vision first. Many passive designs that I come across take existing features and change them to work for other ideas. A sunroom or coldframe becomes a way to heat the house. I like the idea, but what if you do not have the space for a sunroom? What if you do not want coldframes along the wall of your home? My real problem lies with the fact that much of the literature on the topic deals with new construction, which leaves us with older homes in the lurch. Even though this sketch is a mess, I wanted you to see the thought process, so you can look at ideas in a new light on your own. In solar water heating, we are taking the water into the heating system through a series of pipes which will be heated by the sun. To ensure consistent heat, we lay these pipes on a black surface to absorb the heat. To further improve the heating, we create a thermal mass to hold the heat under this black coating. To further help the heating effect, we can enclose all of these parts in an insulated box with a glass top. In passive heating, we allow the sun to heat up a space, like a sun room, greenhouse, or a cold frame for plants. To relieve the heat, we open a window to vent. For a passive heating system, we introduce holes in the wall of our home, through which the heat passes into the interior rooms. By planning room layout and openings, we can have the heat move through the home. This means that the heated structure needs to be next to the home. It also means that our homes should be designed for this movement of hot air. Traditional skylights are rectangular windows set into the roof with a light well coming down into the space below. Their design leads to leak problems over time. The improvement on the idea has been the light tube. The round shape sheds water on the roof better. The tube has a mirrored interior surface, and the lens below reflects light efficiently. I have three hallways in my home that do not have much in the way of natural light. I would love to have the light tubes in these spaces. I had started to build a solar water heater, but I did not complete it yet due to other projects. What you are seeing in my sketch is taking the idea of a coldframe, but placing it on the roof. The frame is a larger version of the solar water heater idea, but I thought that the heat could be used for heating as well. The cold air can be drawn into this space through the light well, which provides me with the light that I want. The heated air is then forced out of this space by a solar powered fan, much like a solar attic vent fan. This heated air can be delivered to the supply plenum, where it is then distributed to the house through the normal air conditioning system. The light well opening could be sealed during the summer. The solar powered fan could be turned off to stop hot air from the cold frame being delivered into the forced air system. Even a damper could be placed in the line to seal this space from the rest of the house. Most people would not think of adding the coldframe to their roof, but that is my point. How much space do we have around our homes? I thought about the fact that oder homes may not have the best design for installing passive features. The amount of area needed for certain features can also be an impediment. If you are looking to incorporate these ideas into an existing home, you will have to become resourceful. You will notice that my design is rectangular in form. To avoid one of the common issues with skylights, I add a cricket, also called a saddle. This is a bump in the roof behind a chimney to divert water away from the home. These crickets are not installed with skylights, but small ones may be a good idea to prevent leaks. Any ideas on how to add passive heating to your home? This entry was posted on Friday, November 5th, 2010 at 1:15 pm	and is filed under Green home conversion. You can follow any responses to this entry through the RSS 2.0 feed.